What is the theorem which has, for years puzzled the scientists? The study of relationships of numbers is known as number theory. It ranges from the rudimentary study of natural numbers and Pythagorean triples (integers which satisfy the Pythagorean theorem), to more complex theorems such as the Fermat’s Last Theorem. Pierre de Fermat was a seventeenth century French mathematician. Despite being a lawyer by profession, Fermat was more passionate about mathematics and spent his spare time pursuing this interest. His mathematical curiosity led him to develop the foundations of differential calculus. He is also thought to be the first person to use the general power approximation for the evaluation of the summation of areas, or in other words, the integrals. 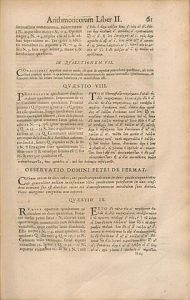 Fermat’s enthusiasm for mathematical patterns is quite explicit from the notes he made in the margin of his personal copy of the Ancient Greek mathematical text “Arithmetica”, a book written by the mathematician, Diophantus, that studies problems related to solving equations. In these notes, Fermat talked about different mathematical theorems. Later, they were published by his son in the form of a commentary. When n is equal to 2, the above equation becomes the famous Pythagoras theorem which states that the sum of the squares of the lengths of the two shorter sides of a right-angled triangle is equal to the square of the length of the third side. While the proof of this theorem remained elusive for a long period of time, most mathematicians at that time believed that the answer lied in, what is called as, the Taniyama-Shimura conjecture – the mathematical idea of true and false. 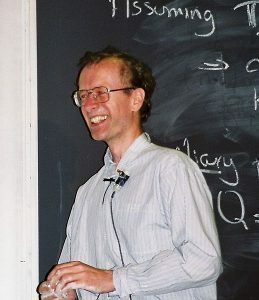 About three hundred years after Fermat, Andrew Wiles used this very conjecture to formulate a proof that he presented at a lecture in Cambridge in 1993 titled ‘Elliptic Curves and Galois Representation’. However, a mistake was pointed out in his proof a year later, which was then rectified in 1995. I have discovered a truly remarkable proof of this theorem which this margin is too narrow to contain. However, given the complexity and nature of the proof it seems that seventeenth century mathematicians were not well-equipped to have come up with it. This begs the question: Was Fermat joking or did he really have the proof! Previous articleRoad Construction: A step towards green environment? Rehan Naqvi is first year student of Physics at CIIT, Islamabad. Mathematics, Physics and Philosophy are his areas of interest.